Battery performance of the Galaxy S10+ has been touted to be as class-leading. The introduction of a larger battery, more efficient screen as well as a new generation of SoCs are sure to bring improvements over last year’s Galaxy S9. One aspect that readers will have waited for impatiently is our testing of the new Exynos 9820 variant against the Snapdragon 855, which has also been one topic I’ve been extremely interested to see. We run Samsung's Galaxy devices at the full potential they can deliver, something we've done for several generations now. This means that the screen resolution is set to the native 1440p of the display panels, and the new battery settings on the S10 were also set to "Performance" mode. In our web browsing test, both Galaxy S10+s are showcasing outstanding longevity at 13.08h for the Exynos and 12.75h for the Snapdragon variant. Least to say, I was extremely surprised to see this result even though we measured the Exynos 9820 CPU to be quite less efficient than the Snapdragon 855 in peak performance efficiency. I would have not expected the Exynos to match the Snapdragon, much less slightly beat it. 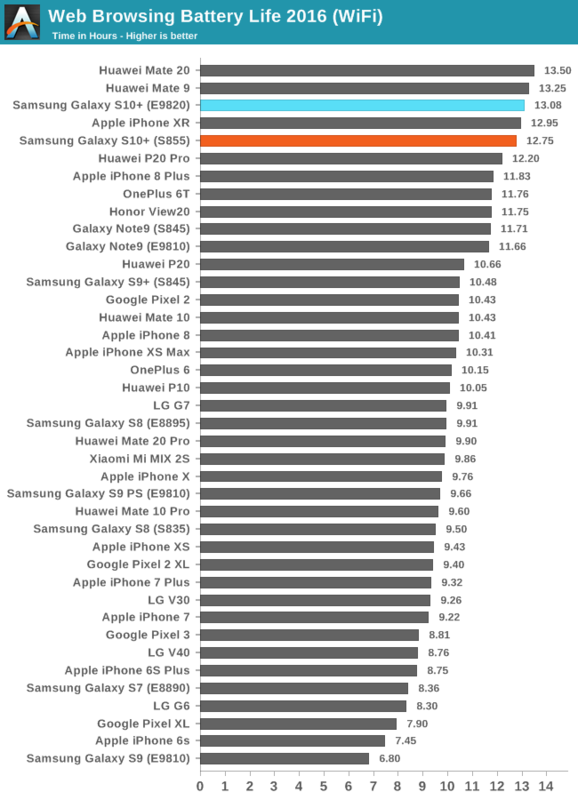 Here, in absolute terms, the Galaxy S10+ aren’t quite as impressive as on the web test and further lag behind the excellent results of the Kirin 980 devices. Nevertheless, these are some impressive figures and again it’s very good to see that both units are almost evenly matched, this time the Snapdragon unit lasting slightly longer than the Exynos. 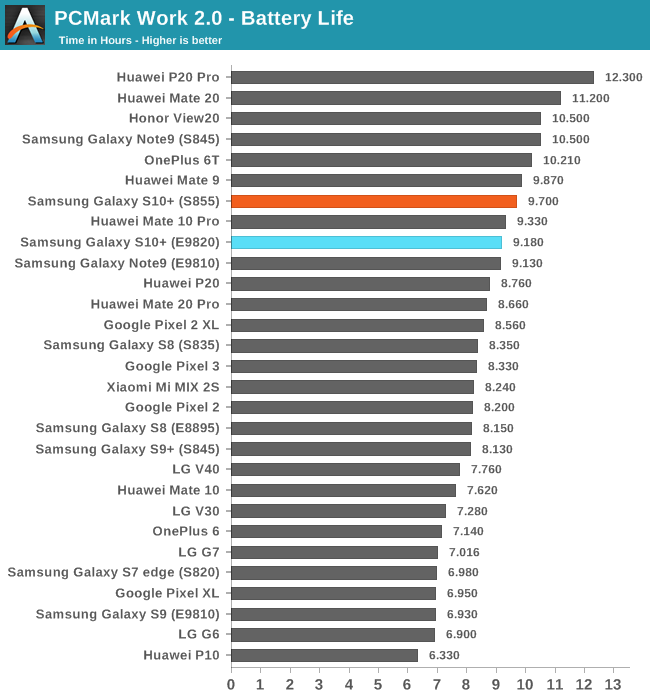 To explain these results, we have to keep one thing in mind: the Exynos unit will have posted worse performance than the Snapdragon, so it will have spent more time at the lower more efficient frequency states. One thing that I also noticed, is that in very low idle loads where there’s just some light activity on the A55 cores, the Exynos 9820 variant actually uses less power than the Snapdragon unit. The figures we’re talking about here are 20-30mW, but could possibly grow to bigger values at slightly more moderate loads. It’s possible that Qualcomm has more static leakage to deal with on the 7nm process than Samsung on 8nm, one thing that I’ve come to hear about the TSMC 7nm node. Furthermore, one of the biggest improvements for the Galaxy S10 over past devices isn’t actually the SoC nor the actual bigger battery. It’s actually the display as well as the base power consumption of the phone. In Airplane mode, the base power has gone down by almost 100mW compared to the Galaxy S9+ which is a fantastic development and is especially something that will result in higher low-brightness battery life. Currently in my time with both S10+ units, I can say they’ve been among the longest lasting Android devices I’ve tested. One issue I can confirm with the Exynos unit is that after a voice call in any app, the phone isn’t correctly entering its lower power state, and will suffer from increased idle battery drain until a reboot. This is something that hopefully Samsung addresses in a firmware update as it doesn’t look to be a hardware related issue. When not affected by this bug, both phones idle very similar to each other and slightly better than the S9+ I use as my daily device. Dude, the ROM is about 4 GIGS. He may not be offended but I AM. Every time a customer brings a Samsung phone to my shop for repair, I get offended. Like wtf is this trash doing in my store? But I have to calm myself down and explain to the customer how sorry that pos is and patiently trying to figure out the problem. In the end I always suggest that they get rid of the phone and get another - any other brand except Apple. I’ve seen many broken phones but the most were Samsung’s. Can’t receive calls or text from certain phones, frozen, virus, acting strange, crapwiz... you name it.